LYRICX. 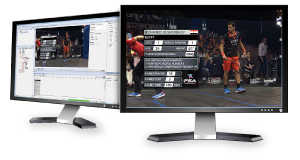 YOUR ESSENTIAL GRAPHICS CREATION & PLAYOUT SOLUTION HAS ARRIVED. Whether designed for news, sports or entertainment, graphics have not only become an essential part of the broadcaster’s storytelling process, they’ve become essential to the viewer. Graphics in news stories, particularly graphics emanating from within virtual sets and supported by virtual and augmented reality, help the viewer to better and more easily understand complex storylines. In sports, telestrated and player tracking graphics provide not only the play-by-play analyst – but also the viewer themselves – with stats-driven graphics that have the ability to take the viewer inside the action on the field as well as inside the strategy of the team. And here in the United States, as the 2016 Presidential and Congressional elections reached a fever pitch, broadcasters relied on ChyronHego's data-driven graphics to give viewers up to the minute poll results. ChyronHego’s entire history has been, and our forward-looking future is all about, the creation of innovative solutions and workflows that push the envelope of graphics creation and playout. This is who we are and this is what we strive for every single day. With the recent release of LyricX 2.0 and the spotlight given it at NAB 2017 (Booth SL1210). LyricX marks a significant milestone in our goal to dramatically improve the user experience for Lyric designers and operators while surpassing Lyric’s well-earned reputation for high performance and reliability. LyricX achieves this goal while introducing innovative features yet retains all of the most popular Lyric features designers and operators have come to know, love and rely on. Create and playout graphics quickly and effortlessly. LyricX’s Timeline is now faster and easier to use when building and animating graphics. And, an improved usability experience and easy access to an extensive feature set means LyricX is now faster and more intuitive than ever. Find it. See it. Now. LyricX’s highly intuitive Scene Graph with Filtering makes it easier to identify and find elements. Customize your workspace to suit your workflow. LyricX’s updated user interface, now with docking panes, is now easier to learn and even faster to navigate. Take your graphics to the next level with LyricX’s Powerful API. We think you’re going to love LyricX and we encourage you to add or upgrade to LyricX today. Intrigued? Watch our short LyricX introductory video.